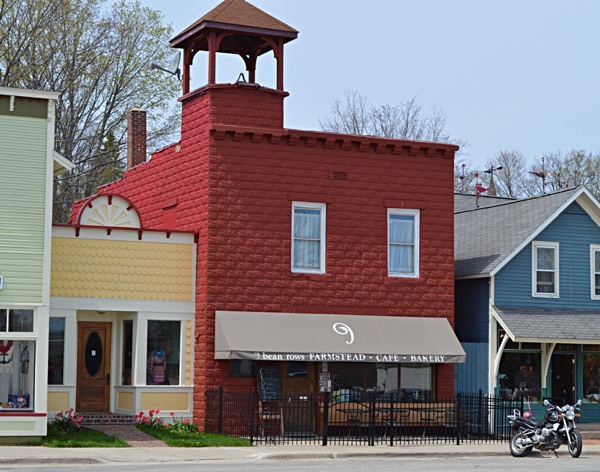 The 9 Bean Rows restaurant is located in the red historic firehouse at 303 St. Joseph Street in downtown Suttons Bay–also known as the Suttons Bay Hose House. It’s a quirky old building full of history, charm, and soul. The restaurant has been garnering press since opening its doors, and was recently featured, along with a few other local restaurants in the Grand Traverse area, in Hour Detroit magazine by chief restaurant critic, Christopher Cook: A Taste for Travel. In January, the restaurant received a very nice mention in a Michigan Radio Stateside interview with Cynthia Canty and Christopher Cook, chief restaurant critic for Detroit Hour magazine: Traverse City’s emerging food culture. Our kitchen offers a full, made-from-scratch menu created by co-owner and chef, Paul Carlson, and his talented cooks, that promotes locally grown, seasonal ingredients (the menu changes frequently), and we have a full bar featuring some of our favorite local breweries, cideries, and wineries. We also offer craft cocktails and a hand-selected collection of whiskey, rum, bourbon, tequila, vodka, and more. Everything we make is from scratch using only the best quality ingredients–a majority of which are local to Leelanau County and to Michigan. We never pull pre-made food out of a box to serve our customers, and we never use a microwave. We believe in real, simple food. During warmer months, customers can sit street-side and people watch, or enjoy time with friends and family under an umbrella on the back patio. and delicious menu, and classic brunch cocktails like the Mimosa, Bloody Mary, and Bellini! Call 231-271-1175 for reservations, and walk-ins are welcome, too! Here are the latest photos of 9 Bean Rows via instagram. If you have an instagram photo to share of your visit to 9 Bean Rows, choose “9 Bean Rows” as your location and your photos will appear in the photo stream below.